Kfar Sha’ashuim voucher- expires soon! Big Deal is offering a 100 shekel voucher for Kfar Sha’ashuim for only 60 shekels! Start your Chanukah/ birthday present shopping now. Voucher is only valid at Hadera and Raanana stores. You can buy up to 2 vouchers and use only one per day. No double sales. 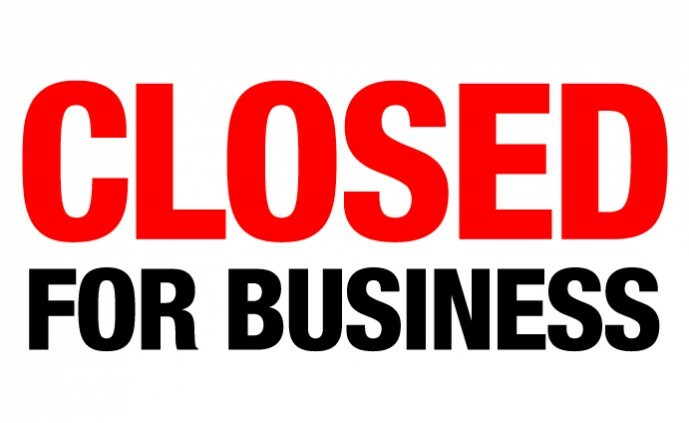 The Jerusalem municipality issued an immediate closure notice (“צו סגירה”) to the poultry slaughterhouse “Delicious”, citing severe hygiene deficiencies leading to an immediate danger to public health. The slaughterhouse, which is situated in the Atarot industrial area, is owned by “Glatt Of” and is under Eidah Charedit Badatz hashgacha. Despite its highest kashrut standards, it did not abide by basic hygienic standards and has been operating without a business or manufacturing license. Some of the deficiencies cited in the closure request included difficulty keeping poultry at the proper refrigerated temperature and environmental pollution which may lead to groundwater contamination. Veterinary inspectors will be at the slaughterhouse Sunday to ensure that the closure notice is implemented. **I would like to emphasize that Glatt Of owns two slaughterhouses, a factory that makes poultry products and a factory that makes fish products. The only place that is being closed down is the slaughterhouse on Hatotseret 19, Atarot. This closure notice does NOT imply that there are any hygienic or licensing issues with the other facilities owned by Glatt Of. As a result of a routine examination performed by the Food Control Services of the Ministry of Health, it was decided to be extra cautious and remove “Revai Pergiot Memulot” (Stuffed Pergiot Quarters) with onion and mushrooms from the shelf because there is a suspicion that the bacteria Listeria monocytogenes is present. It has bar code number 2410874, is wrapped in pairs and has a red tray with an expiration date of 14 Oct 2015. Consumers who have purchased this product are advised not to eat it and to call 08-6246000 with any questions. Listeriosis, a serious infection usually caused by eating food contaminated with the bacterium Listeria monocytogenes, is an important public health problem. The disease primarily affects older adults, pregnant women, newborns, and adults with weakened immune systems. However, rarely, persons without these risk factors can also be affected. The risk may be reduced by recommendations for safe food preparation, consumption, and storage. For more information, see the CDC web site. Going on now. To find a store near you, click here. Today we are checking out 200 grams of margarine, which is significantly cheaper in the US and England. 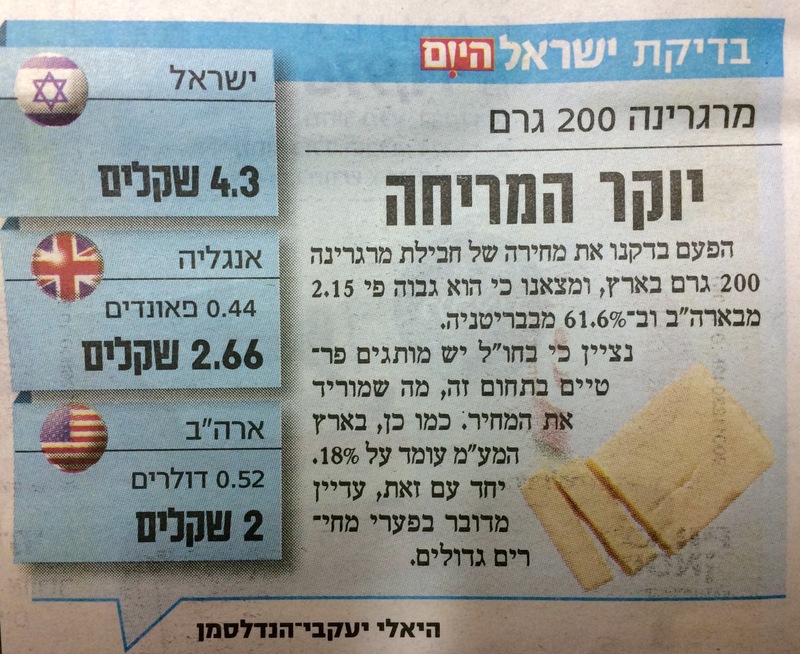 The author states that there may be several reasons for this difference: (1) we have an 18% sales tax on margarine and (2) there are generic brands of margarine in the US/UK and not in Israel. For those of you who don’t know, Etz Maleh sells adorable, (mostly) solid wood furniture for children. Their prices can be quite intimidating sometimes so when a sale comes along, it is worth it to take advantage of it. On 27 November, 2014, Emahot Konot Beyachad and Etz Maleh joined together for a great sale in all of their stores– 18% off all products except basic beds (“Omer” and “Ophir”) and 20% off all toys. You must print out this coupon and bring it with you to the store. If you haven’t bought winter footwear yet, here is a great deal for Blundstones, Crocs, Scholls, and other great footwear directly from the importer Carrot.co.il. Use the coupon mbt1415 when you check out. Blundstone boots (Model 548)- regularly 600 shekels in the store- with the coupon and sale they are only 509 shekels! Crocs Hover Lace Up- regularly 200 shekels in the store- with the coupon and sale they are only 84.15 shekels! I don’t know how long the sales and coupon is good for so don’t wait too long! Limit 5 doughnuts per purchase. This isn’t food related but it is important enough that I want to pass the message on. This month is dedicated to increasing awareness of prostate cancer. To that end, Beilinson Hospital in Petach Tikva will be offering free screenings for prostate cancer tomorrow, 26 November 2014, from 9:00-13:00 (9am-1pm). The screening is only for men aged 50-70 years old. There is no need to make an appointment or bring a “tofes hitchayavut” (טופס התייחבות), and there is no charge. The screening will take place in the outpatient clinics of the hospital (“מרפאות חוץ”). Some of you might remember that Burger King used to have a prominent place in Israel’s fast food economy but then suddenly disappeared. Burger Ranch, however, has been an institution for many a year and is the focus of my occasional nostalgic daydreams. It might surprise you to know that Burger Ranch and Burger King were both owned by the same people- brothers Eli and Yuval Orgard. When they purchased Burger Ranch in 2008 for 25 million shekels, they already owned Burger King and debated whether it was advisable to own two burger chains. In 2010 they decided to shut down Burger King altogether. Now in 2014 the Orgad brothers have decided to sell their 50 Burger Ranch chains and have them all converted to Burger Kings for 50 million shekels. The new owners are a partnership of several businessmen such as Asaf Greenberg who owns the Frangelico restaurant chain and Rani Tzim who formerly owned Kimat Chinam and currently is an owner of Retail 3000, which owns Office Depot and Kfar Shaashuim. What is your opinion? Are you ready to see the demise of Burger Ranch? Do you think Burger King can survive this time around? I personally am much happier seeing my “Jewish McDonalds” in Israel. You can leave the American chains on the other side of the ocean.